I would like to introduce Pam from Threading My Way to you today. 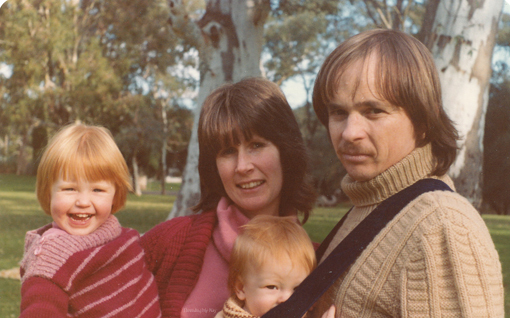 I am sure a lot of you follow Pam's blog already! Pam is sharing a lot of beautiful projects on her blog. She sews for herself, her family, and also supports a few charities by making beautiful things that put smiles on the faces of little people. Check out Pam's tutorials! Pam also shares tips for bloggers and runs an ongoing link party which I love. When I started talking with Pam about You and Me series I felt I was talking with someone who was sharing my passion about building healthy strong relationships between parents and children. Another thing Pam and I have in common is our love for sewing. 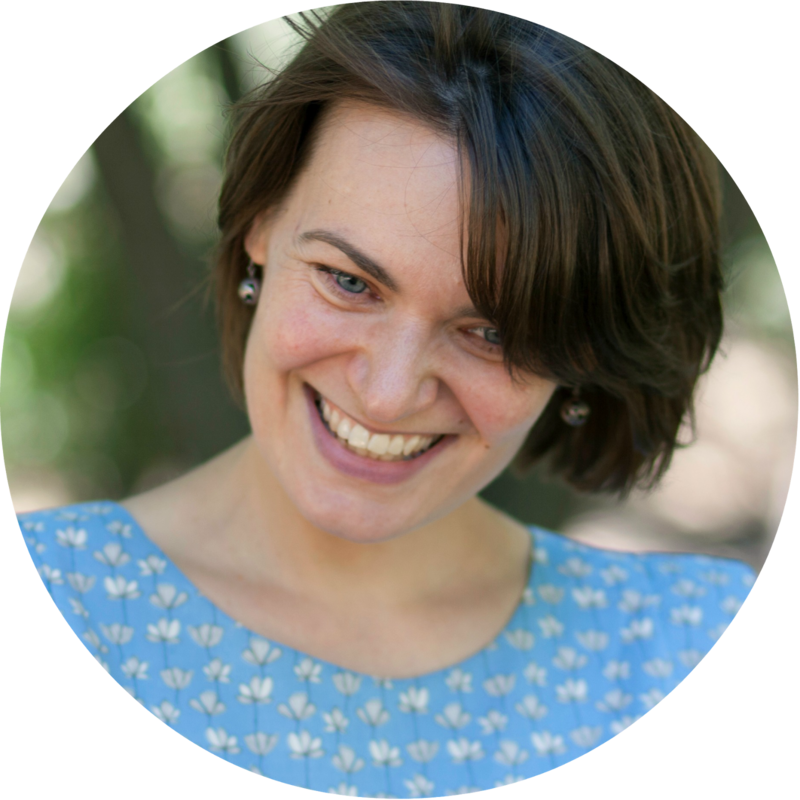 I'm thrilled to be here at While she was sleeping, guest posting for Jenya, in the lead up to the You & Me series. and between father and daughter. Life as a couple will never be the same. Once a precious little one enters your lives, you will lose a certain amount of freedom as you nurture and care for this helpless being. You'll also lose a lot of sleep!!! But what you will gain in return, is perhaps something you have to experience to understand. Watching your tiny baby grow, seeing their first smile, encouraging them as they roll over, clapping as they crawl, cheering as they take their first steps and just being there as they achieve all of the milestones; it's simply magical. Sure, there's days when things don't go smoothly and you wonder if you'll ever have time to yourself again. Trust me, you will and sooner than you perhaps want. That little baby will soon become an active toddler and life becomes very hectic, especially when a little brother is born, but the rewards of hugs, cuddles and laughter are greater, as you spend time catching balls, building towers, singing rhymes and making playdough creatures. Two becomes three and things are stepped up another level. Things don't remain the same for long. Each stage is replaced by another, with some parts of the journey being easier than others. Right from the very beginning, you are building upon that first bonding and forming a very special relationship with your kids. Kids need time from parents, and lots of it. Sure, they need to be fed and looked after, but they need more than that. They want to have fun playing. By having special, fun times with your kids, you will not only be strengthening your relationship, you will be teaching them about life. How you and your kids play, have special times and fun, will, of course, depend on their age. Jenya's You & Me series is all about celebrating the art of sewing and the art of building relationships with our little (and not so little) people throughout different ages and stages of our lives. My not so little people are all independent adults, living in their own homes, so it's really great when we get to spend time together. Invariably, at most family gatherings, one of the kids will say, Remember when we... and we get to relive fun childhood or teenage happenings. Over the years the kids have had input into many sewing projects, mainly with fabric selection and pattern choice, as in the photo above. 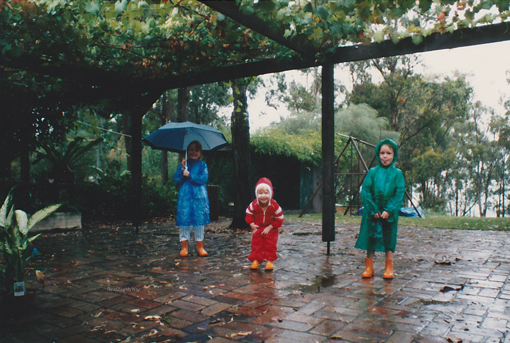 Looking back at photos now, the kids wonder how I could have allowed them to wear some of the resulting garments. Think 80s / 90s and super bright, fluoro colours. At the time, however, they loved them. In recent times, I've been able to collaborate with my adult kids on a few sewing projects. 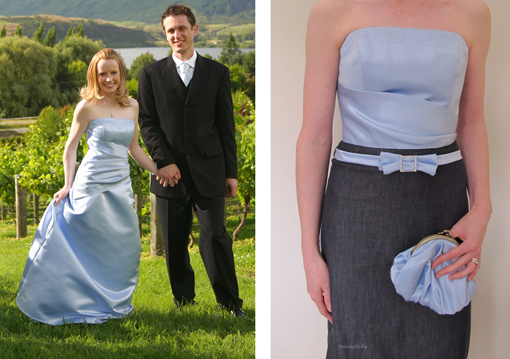 A couple of years ago, my daughter came up with the crazy idea that I could turn her wedding dress into a formal day dress. Although not initially overly enthusiastic, with her encouragement, the wedding dress was transformed. 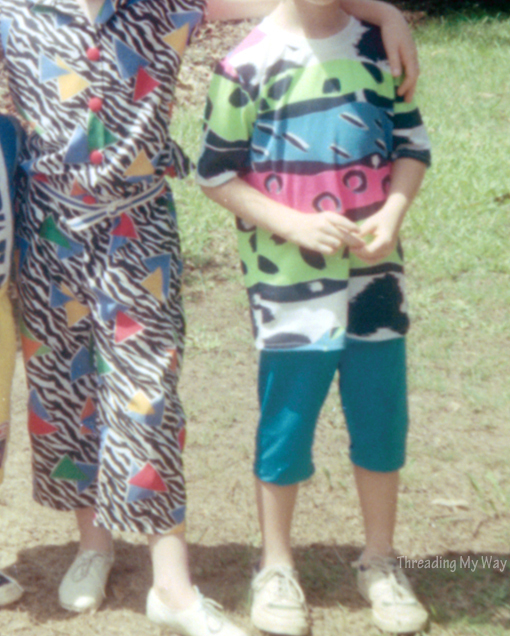 We spent a lot of time together, discussing how we'd do the refashion, then much time cutting, trying on and sewing. Once we actually started, the process really was a lot of fun. 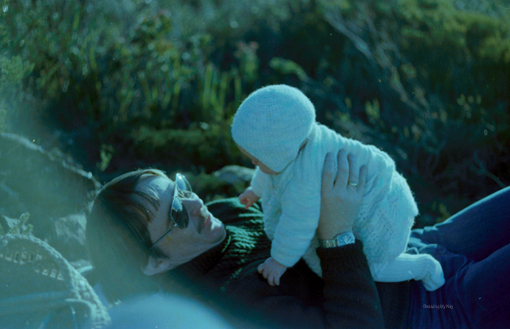 I learnt a lot from my daughter that day. She's not hesitant about starting a project, even if unsure how she'll get to the end. She's prepared to give things a go, even if it mightn't work out. 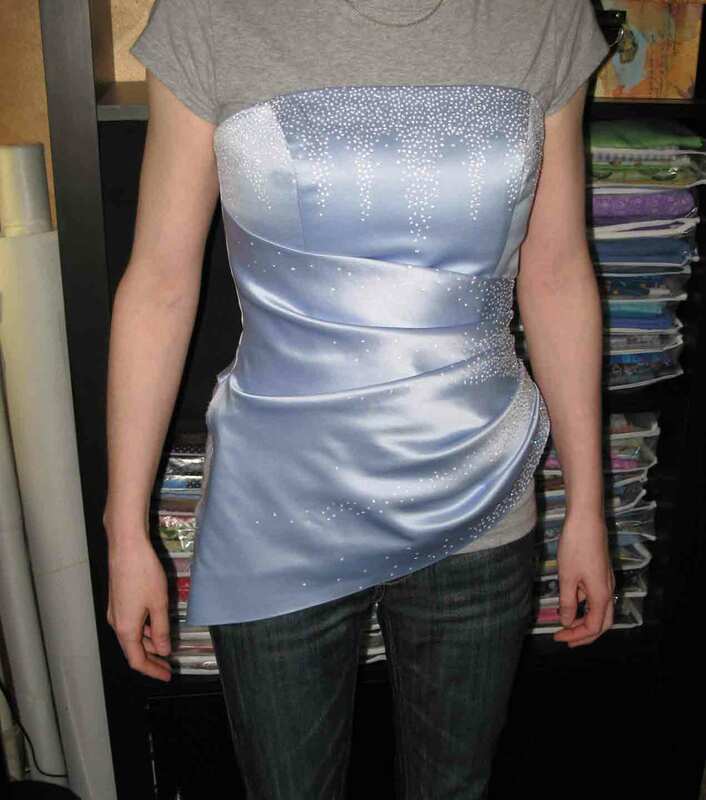 My daughter gave me the confidence to break the sewing rules that had been ingrained in me, which in turn, led me to be more creative with my sewing. You can read about our wedding dress transformation, from my daughter's perspective, over at Little Ladybird. This dress has since been refashioned again. My eldest son suggested we get together to make a leather iPhone case. I jumped at the chance. I'd never sewn with leather before, so I researched the process and he purchased a couple of different types of leather and some felt. We spent a fabulous day together, figuring out how we'd make the style he wanted, and then making it together. Right at the end we cut a thread, making the case unusable, which didn't matter in the slightest. 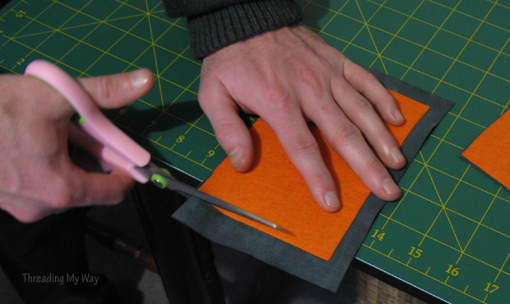 We had made a very successful prototype and we have lots of leather left over for the next project. 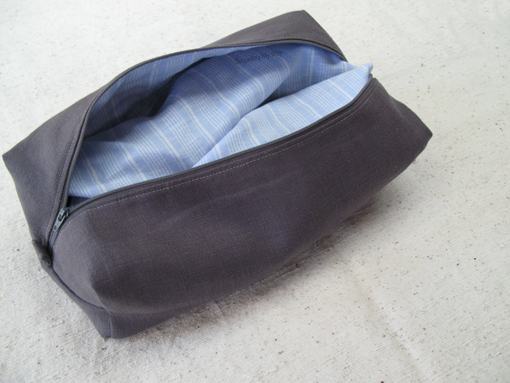 Some time later, we also worked together on a travel shoe bag. In this instance, we spent much time discussing designs and choosing fabric. My youngest son and I have planned a sewing project that involves robots. I initiated this one, remembering the robots my son used to draw as a child. The robots are drawn and sewing has been started, but you'll have to stay tuned to see the outcome of this collaboration. I'm excited, but it'll be a while before it's finished. Working on ventures together with my kids, strengthens the relationships I have with them. I can, and do, learn so much from all three of them, not to mention I love any opportunity to spend time with them. Sadly I have no photos of reading with my own kids. Reading with my kids was a special time which happened EVERY day when they were young, beginning when they were tiny babies. I can't remember when I stopped reading with my kids, but it was long after they could read independently. And now I get to do it all again, building relationships with the next generation, except that now, I have more time... all the fun without the hard work. Reading with the little people is a ritual when they come over to stay. There's always multiple books before bed. 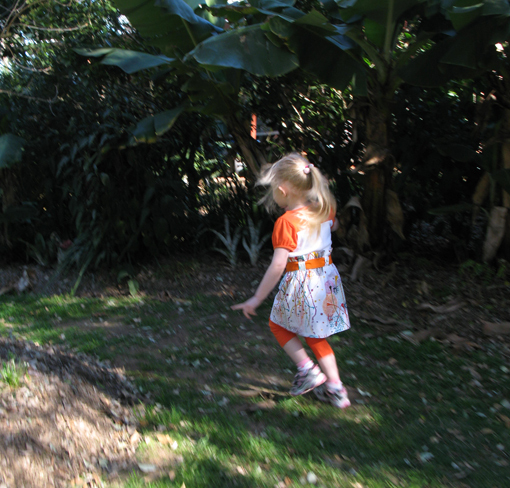 This little outfit was inspired by one of our favourite books, The Paper Bag Princess. 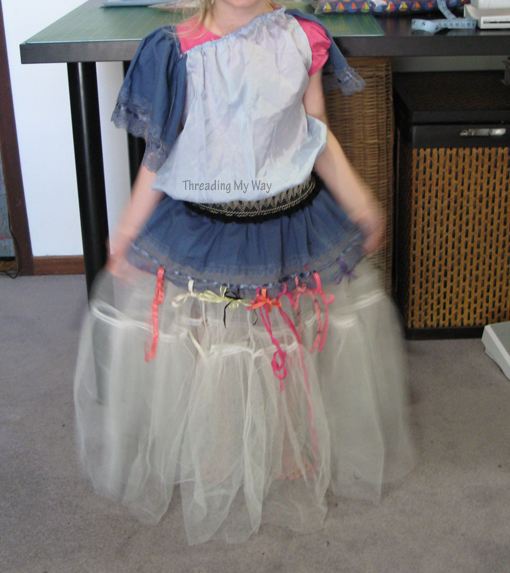 Making a princess dress was fun!!! The aim of this project was NOT to produce a perfectly sewn dress, but to make one of the little people feel like they were an active participant in the whole creative process. According to Little Miss, it was the Perfect Princess Dress. Building strong, positive relationships begins at birth and continues throughout life. Perhaps my post shows the other side of the journey. All the things we did and all the time we spent with the kids when they were young, has paid off. I'm not going to pretend it was always easy, or that I did a perfect job. Being a parent is the hardest job I have ever done, but it is, without a doubt, the most rewarding!!! You & Me begins next Monday. I'm really looking forward to seeing and reading about the special projects that are helping to develop strong, positive relationships. Thank you Pam for sharing your beautiful story and fun projects. I hope the robots project will be finished soon so we get to see it! Thanks, Jenya, for the opportunity to guest post on While she was sleeping. You & Me is going to be a great series... really looking forward to it. Thank you for being a part of the series Pam :) As a mum of a younger child I love hearing stories from those who have older children :) So many wonderful things to look forward to! Love, love this post, I feel the same, building relationships with our family members is so so important. I can't wait! 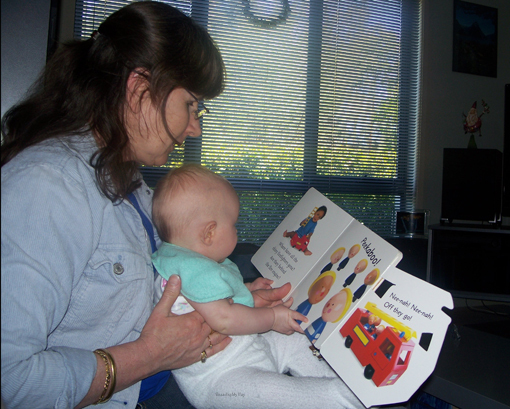 My grandson requested a reading this weekend! So we are going again. I read to him the first six months of his life. I hope he loves books as much as his grandfather, aunt, great grandparents, & me, his MiMi do even at our ages. 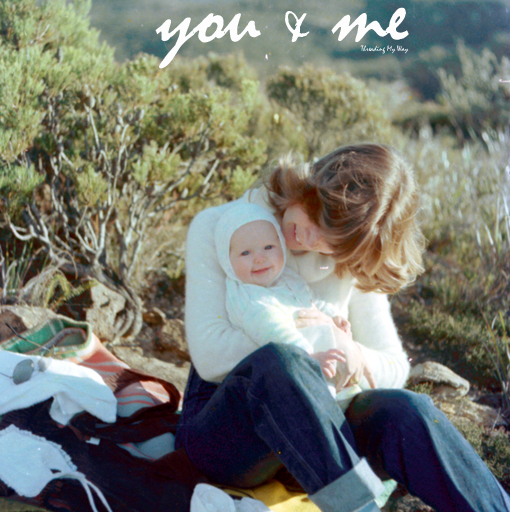 What a lovely post Pam and a great way to begin You & Me - I'm so excited for this series!! This rocks!!! My daughters (age 5 and 3) filled out those kind of mad lib mother's day sheets...the ones that say "My Mom is ___ years old" and so on and they had some crazy answers. (FYI according to my children I am 69 years old, I love puzzles and playing outdoors, all things which are not at all true!) The one thing the girls both wrote is that Mommy is good at, or Mommy loves to SEW! I was so psyched that they knew that and associate that with me. Great series, can't wait! I hope my son is interested in sewing once he is older! What a great story. What a lovely post! Pam, you brought a big smile to my face :-) And I am looking forward to the You and Me series! Thank you very much for your warm comments ladies!